We have had an unbelievable peach season here in the Southwest this year. I celebrate each calendar season through my culinary tales, and I get sad when a season ends. Now September, we are seeing the end of these wonderful peaches, some of the best melons I have had in my life (particularly an orange-fleshed honeydew), sweet corn on the cob (I recently learned that it is hard to get corn on the cob in Europe), and field-grown tomatoes. As we slip into autumn, I perform some mental gymnastics and get myself ready for apple pies and pear tarts, squash purées and soups, smoky chile peppers, and all variety of earthy root vegetables, such as the beets I used last week. I am never disappointed as I go from one season to the next; there is always such an abundance of good produce to be found in our market. 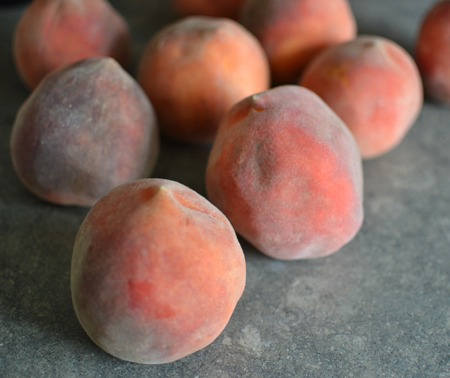 To celebrate this year’s bountiful peach season, I am going to share a recipe that comes from my friend Paula in Argentina. She is the author of one of my favorite blogs, Vintage Kitchen Notes. To Paula’s and my shared readers, I hope you will appreciate the repeat, as my goal is to share her recipe with still more blog friends. 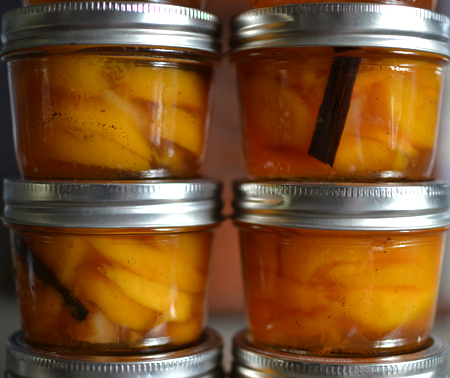 Back in June when peaches were just coming into the market, I mentioned Paula and her recipe for Peaches in Vanilla Bean Syrup. And that is today's recipe, with thanks to Paula. I made these several weeks ago, so I can tell you all the ways we have used them since. They are amazing simply served over vanilla ice cream - a perfect summer treat. We also had them atop slices of almond cake (the recipe for this cake is "in testing" and will he seen here soon!). When the weather cools, we anticipate having them on pancakes or waffles, or on top of a sweet mesquite quesadilla filled with local goat ricotta and honey. I dare to say they are irresistible eaten straight from the jar, as well, and the bonus of this recipe is that the leftover syrup can be bottled and saved for use all winter. Abrazos to Paula for this week's inspiration. 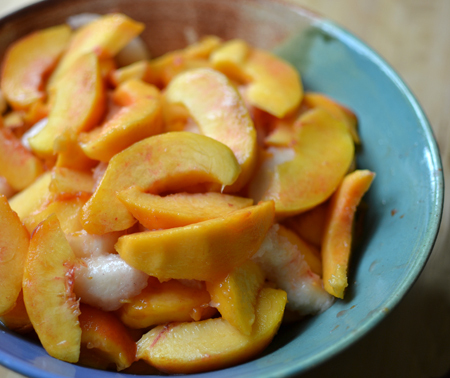 Wash the peaches and plunge them into boiling water for 30-45 seconds. Allow them to cool, then slip off the skins. 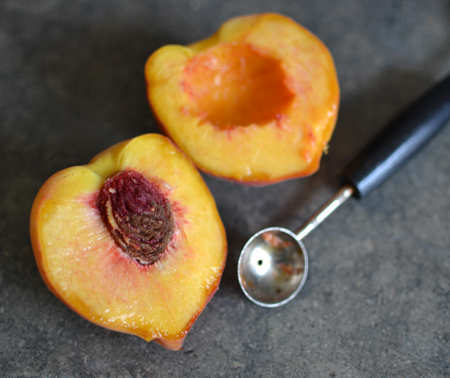 If they are freestone peaches, cut them in half and remove the pit. Using a melon-baller, scoop out the red parts. 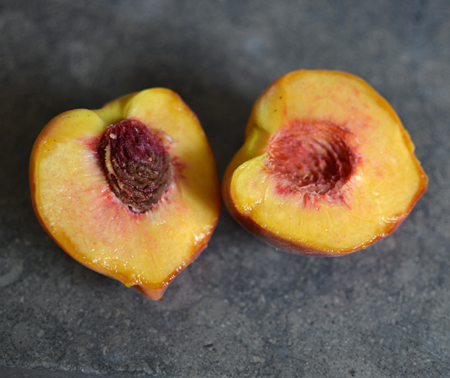 While they will look good at the beginning, it is these red parts that cause the quick browning of the peaches when canned. If they are cling peaces, simply cut away slices into a bowl. Put the water and sugar in a kettle that will hold all the peaches. Make a slit down one side of each vanilla bean and, using the side of a sharp knife, scrape down from one end to the other to release the seeds. Place both the seeds and beans in the saucepan. 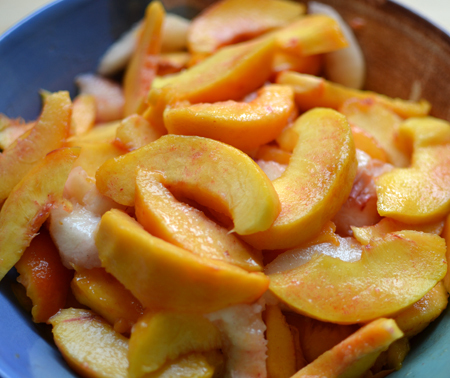 Bring the water, sugar, and vanilla to a boil, add the peach slices and cook for about 10-15 minutes. They should not get mushy. The timing will depend on how firm your peaches are. 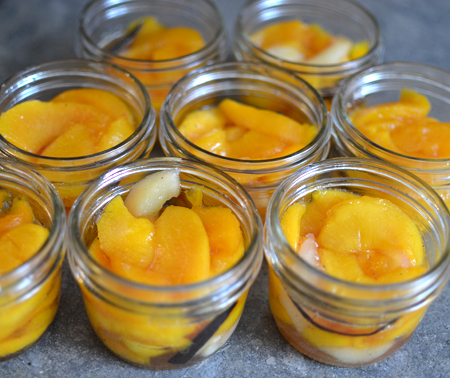 When ready, use a slotted spoon to remove peach slices, dividing them among 6-8 sterilized pint jars. Divide the syrup among the jars leaving ½-inch at the top. 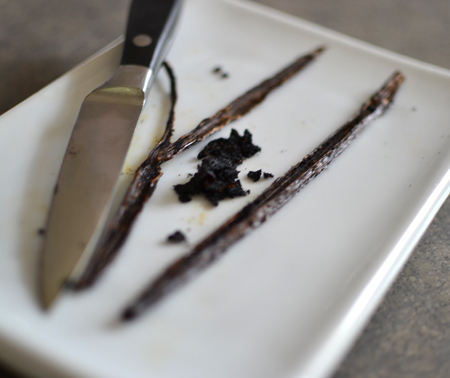 Cut the vanilla bean into pieces and divide among the jars. Wipe the rims so that they are free of any syrup or small pieces of peach. Using sterilized lids, cover and seal the jars, then process them in boiling water for 15 minutes. Let cool. If the sealing button didn’t “pop” for some of the jars, keep those jars in the refrigerator. Otherwise, store jars in a dark cupboard until ready to use. PS: I made your limoncello with vanilla beans, and am posting it next week! Not surprised that we're on the same page. Okay, I HAVE to make this recipe and seal some in jars for the winter. Towny brought home two peaches from today's farmers' market--we will see how they are. You know that good peaches are hard to find here. If they are good, we will go back to that source; if not, we will keep looking. And your photos are particularly inviting. Thanks to you and to Paula! I hope your peaches were good, Susan. I was surprised at how many were still at market today - even though we were all told this is the end! Thanks for your kind words about the photos! 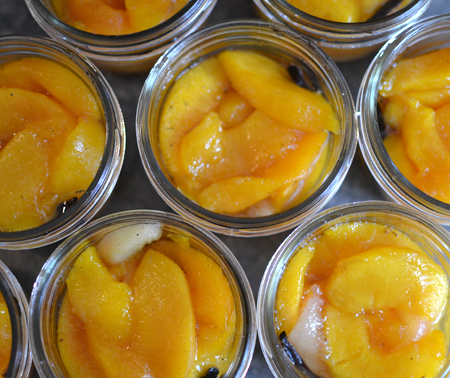 David, loving all about this post - how nice that you used one of Paula´s recipes - your jars look like pure bliss! The title to your post is also quite catchy, and the pictures are amazing, loving that vanilla bean, always do, it is one of my very favorite condiments to use! I have not used many peaches this year, they were not nice at all - we get them mostly from Spain and Italy and the weather was not very summery this year, maybe that is why they were far from sweet and enjoyable. Now I would love to have at least one of your jars, please! Sorry I was late answering to my FB message but I do hope that Mark´s mum will be well - best wishes and all the very best from all us us here! Andrea - I am so sad that you aren't getting good peaches this year. Form my summer in Heidelberg, I recall the fruits being so much better than in the United States. I don't think we had farmers markets then, really, and all fruit came from the supermarket. Ick! But the figs in your tart were gorgeous, so maybe it is a trade off? Bis bald! Rakesh and Swikruti - thank you so much. Yes, it is a heavenly combination - I wish I had thought to write that in the post! The scent of the vanilla is just wonderful. That is definitely the way we have been enjoying them, Valentina! Well, that way and also on almond cake! I remember my mother and aunts all used to can fruit, it was so exciting to watch the process. I can't believe I have never tried it myself as it is such a beautiful way to preserve fruit, and you make it look so easy. I love vanilla as well so this recipe sounds like just the thing to start out with...now I just have to wait for peaches to appear at the market! My mother never did canning - I think she was too afraid. It is pretty easy, though, and definitely worth it. And, of course, we both love Paula! Peaches are my favorite fruit. As spoiled as we are with year-round citrus and strawberries, we don't have local peaches, so I envy you that. And vanilla just adds to the perfection. Susan - I am surprised that you don't get peaches over there. I do envy your good strawberries... luckily, we have good citrus here, too. Nooooo, I don't want to say g'bye. But, this is a wonderful way to keep peaches around for the winter, David. I don't really like dried peaches or much of what's commercially available. Peaches and vanilla. Is there anything better? 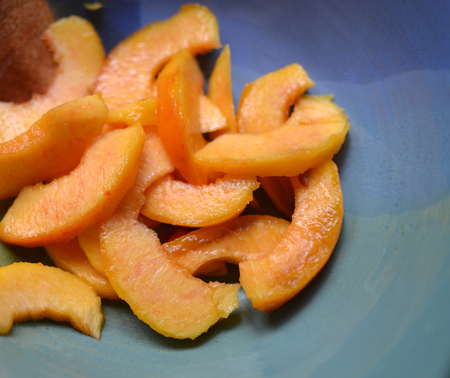 I've been making the most of the peach season here in the States, mainly eating them au naturel. So good! 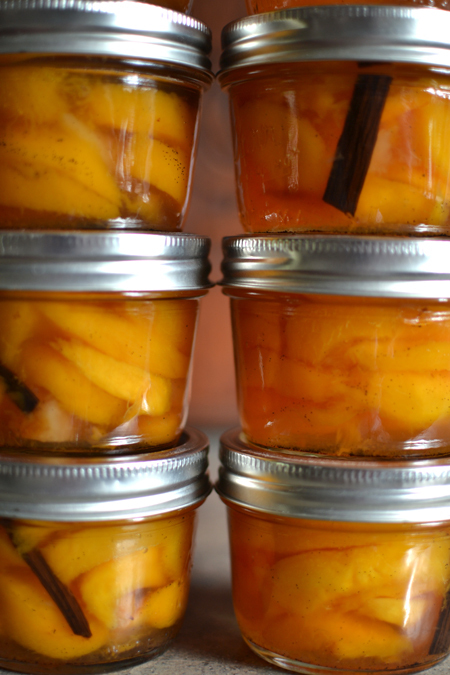 I'd be eating these peaches straight from the jar! Glad you have been enjoying our peach season here in the States, John. With only two jars left, I might have to ask Mark to hide them from me till midwinter when I will really need them... and will probably just open the jar and spoon them down my gullet! Oh these look so good! 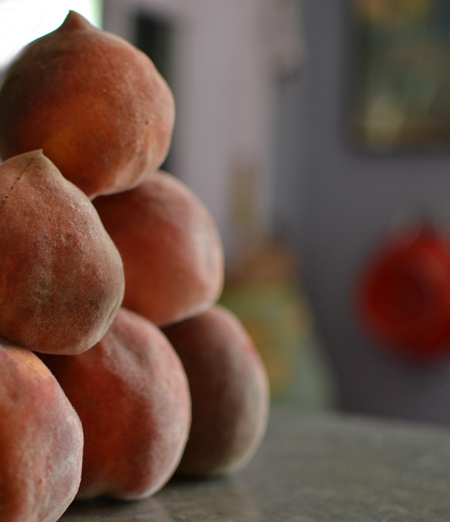 We have been enjoying this year's peach season, too, and are sad knowing we don't have much time left. Thanks, Nicole! I did see something about a chocolate bundt cake come across my email today... must go read about it! We just canned recently for the first time.. It was a cool process!!! Thanks for the recipe! Cristy and Michael - once you start canning, an entirely new world opens up! Have fun! We did have a wonderful peach season. Your recipe looks sensational! Thanks, El! I am glad to see New England had a good peach season, as well. Ha, I love your blog and I am an equal fan of the beautiful Paula... so nice to see her recipe replicated here. She's right, you are so neat and methodical with your cooking David. Love it. As it's the beginning of Spring here, I'm just starting to get excited at the thought of Summer fruits like these. So strange, being on the other side of the world (in a good way, as I can start bookmarking all of these gorgeous recipes for the Summer months! ).Thanks for sharing this recipe David. Love your work! I do love that we live on different sides of the world - aside form new ingredients I have never heard of, it also inspires me for future seasons here. Thanks! The vanilla was an amazing surprise to me!